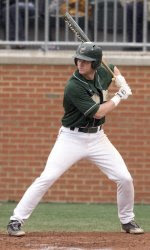 Former Piedmont High standout Rob Lyerly is the only member of the Charlotte 49ers baseball team to be named first-team all-Atlantic 10 in balloting done by the league's head coaches. It's the second consecutive season Lyerly has been named to the first team. Charlotte’s Justin Wilson, Zane Williams, Ryan Rivers and pitcher Joe Yermal were all named to the second-team. Rivers and Lyerly were also named to the league's academic all-conference team. Lyerly is fifth in the league in batting average (.390) and has 60 hits, 44 RBI, 16 doubles and 10 home runs this season. I can not believe that of the six teams in the A-10 Tourney, we have not played 3 of the 5. That is why this league so crazy. URI gets a player as Player of the Year and "we" have the pitching leader and HR champ and they can't make First Team? I hope they play well beginning today.